Today there’s been a couple of updates from Staffordshire Police following some recent criminal activity. It seems there’s a bit of a pattern going around of distraction tactics, whereby a criminal uses a false identity, usually a salesman or a member of the Water, Gas or Electric Board. Remember – these don’t exist! Nobody from the Water Board, Gas Board or Electric Board are telling the truth, as these companies do not exist! 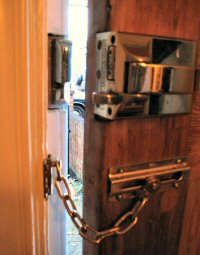 Officers are looking for witnesses of burglaries in Wolseley Road, Rugeley, that took place on Tuesday the 27th of September. fit low cost security lighting as a deterrent. If you’re elderly or disabled, then that means you are a more viable victim for these kinds of crimes – you will be slower to go upstairs and flush the toilet to check the water, or go and get the nice man at the door that drink. As such, you should keep this in mind with your personal security – do not feel rude by making people wait outside, and closing the door on them while you get the money, drink, or whatever else. Never feel as though you should allow someone inside your house. It is your private home, and they have no right to enter it without invitation! Also remember that similar distraction tactics are used ‘on the street’ – it’s not just the people knocking on the door you have to worry about. Contact details can be found on the original articles for witnesses or for questions, and a wealth of information and advice from a friendly, informed user base can be found at the (free) CSPS online forum at http://cspsonline.proboards.com – a wonderful place to share your advice and benefit from others’!